The Jimmy Kimmel Live! have drawn out a monster time container for an outline to help drag out the finale for two hours, and hauled out some tokens from Idol's long past. One of them incorporated Malakar's hair. Afterward, Malakar himself turned out! 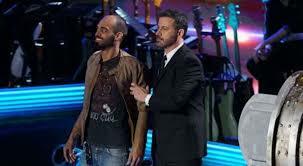 Kimmel said he thought Clay Aiken should be in there as well, however Malakar said he ate him. Toward the finish of the outline, Kimmel advised Malakar to get back in and to return his hair on "so everybody will know who the damnation you are." The section likewise incorporated an appearance from Ashley Ferl, best known as the "crying young lady." Ferl broadly broke into tears when Malakar performed "You Really Got Me," and turned into an early popular video star in 2007. Malakar broadly influenced it to seventh place on Idol's 6th to season, much to the shame of Simon Cowell and alternate judges. All things considered, he is a fan-top pick, as clarified by the responses from watchers on Twitter.